Orinalyser U500 | ARKRAY, Inc. The Orinalyser U500 Urine Analyser is a Multi Strip Urine Reagent Strip Analyser. 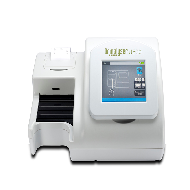 It is a reflectance photometer that analyzes the intensity and color of light reflected from the reagent areas of a urinalysis reagent strip. The analyser throughput is 500 tests per hour and the measuring cycle is 7 seconds per test.